The Vista Hills Chorus invites women of all ages who enjoy singing a capella to join this long-established musical group. “Musical knowledge isn't necessary to sing with this chorus," says the Vista Hills Director. “Any woman of average singing ability, with or without vocal training, will find a part that fits her voice range." Vista Hills even welcomes anyone who hasn't found the right chorus because, “I have such a low voice.” The group is not necessarily looking for solo singers, but someone who enjoys singing in a group. 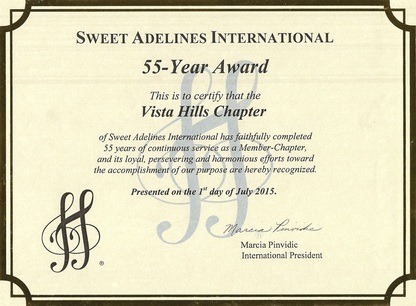 Part of Sweet Adelines International, Vista Hills has been rehearsing and performing throughout North San Diego County for the past 55 years. Singers come from all areas, from Poway to Encinitas, and even include a few from Orange County. We start with physical warm-ups at 7:00, followed by vocal warm-ups. Then we do our musical rehearsal. The content of our rehearsal varies based on our upcoming events. Near the end, we have a short business meeting and conclude around 9:30. Casual clothing and comfortable shoes. We stand on risers for most of the evening; don't fear, if you can't stand for long periods of time, you can always sit down. Bring plenty of water to drink and a pencil to take notes. Please don't wear heavy perfume or hair spray. When we stand on the risers, the fragrances can make those standing around you uncomfortable. We also try to limit talking while we are on the risers so we get the most out of our rehearsal time. ﻿Are you looking for a unique entertainment experience? We’d love to sing for your next function or special occasion including: Singing Valentines, birthdays, anniversaries, and retirements. For the holiday season, we deliver singing holiday greeting cards by phone.